From Ford and Cannatella (1993) and Frost (1985). Microhylids are called Narrow-Mouthed Frogs, althought not all of the species have the very narrow mouths and pointed heads seen in the New World species. This family has the largest number of genera, with more than 60. They are found principally in tropical regions of the world: South America, Africa, Madagascar, SE Asia, Indonesia, New Guinea, Australia (NE only). They also are found in the more temperate regions of North America and Africa. 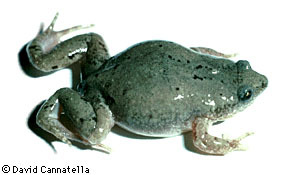 The two genera in the United States are Gastrophryne and Hypopachus. In size they range from tiny forms (10 mm) to moderately large animals (100 mm). In many the body form is tear-drop-shaped, with a narrow, pointed snout and rather rounded body. 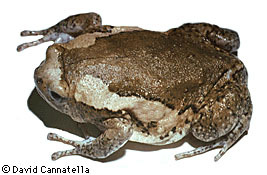 However, some are more treefrog like, with expanded digital tips, such as Kaloula. Breviceps, the Rain Frogs of Africa, have a very short face; during amplexus the male becomes attached to the female by sticky skin secretions. 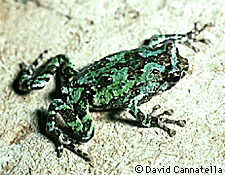 Many microhylids are burrowers, emerging only after heavy rains. Most are dull, but are few such as Dyscophus may be brightly colored. As a group they tend to be ant and termite-specialists. Some exhibit a commensal relationship with burrowing spiders (Crocroft and Hambler, 1989). 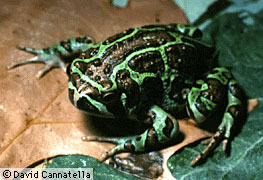 Phrynomerus, the Rubber Frogs, have intercalary elements in the digits and have often been placed in a separate family Phrynomeridae. The most informative reference remains (Parker, 1934). One persistent issue of the taxonomy of Microhylidae has been the inclusion of scaphiophrynines (Scaphiophryne and Pseudohemisus); the group has been alternatively included in Ranidae or Microhylidae (see review in Wassersug, 1984). The ambiguity was based on the description of tadpoles of two Malagasy species by Angel (1931), which were referred to Pseudohemisus verrucosus and P. longimanus; these tadpoles had beaks and denticles. However, these larvae were shown to belong to ranid species (Blommers-Schlösser, personal communication in Wassersug ). Otherwise, the monophyly of Microhylidae has not been questioned. Ford and Cannatella (1993) defined Scoptanura to be the most recent common ancestor of dyscophines, cophylines, brevicipitines, asterophryines, genyophryines, melanobatrachines, Phrynomerus, and microhylines, as listed in Duellman and Trueb (1986), and all its descendants. Scoptanura was used by Starrett (1968, 1973) as a name for the group associated with the Type 2 tadpole. This name is used because it minimizes the creation of new names, not to encourage the use of Orton's tadpole groups. The name Scoptanura occupies a hierarchical position between the (family) Microhylidae and the included groups (subfamilies), but it has no rank. Therefore, it is not necessary to modify the endings of names such as Cophylinae, etc. Microhylidae was defined to be the most recent common ancestor of scaphiophrynines and Scoptanura, and all its descendants; this is the currently used concept of the name. Scaphiophryninae* is a metataxon. Synapomorphies of Microhylidae include the following larval features: absence of cornified denticles, ventral velum divided medially, glottis fully exposed on buccal floor, nares not perforated, secretory ridges of branchial food traps with only a single row of secretory cell apices (Wassersug, 1984), and two or three palatal folds in adults (Parker, 1934). Synapomorphies of Scoptanura include these larval characters: median spiracle, gill filaments poorly developed or absent, modifications of buccal pumping mechanism (short lever arm on ceratohyal, small buccal floor area), absence of the suspensoriohyoideus muscle, and the lack of separation of the quadrato-, hyo-, and suspensorioangularis muscles. Page: Tree of Life Microhylidae. Narrow-Mouthed Frogs. Authored by David Cannatella. The TEXT of this page is licensed under the Creative Commons Attribution License - Version 3.0. Note that images and other media featured on this page are each governed by their own license, and they may or may not be available for reuse. Click on an image or a media link to access the media data window, which provides the relevant licensing information. For the general terms and conditions of ToL material reuse and redistribution, please see the Tree of Life Copyright Policies.